Apples dripping with sweet delicious honey give us a taste of what Rosh Hashana – the Jewish New Year is all about. The famous custom of celebrating the Jewish New Year with apples dipped in honey, remind us of the sweet and healthy New Year that G-d will grant us. This is the message “Super Senior Club” volunteers wanted to share with the senior residents of CareOne at Holmdel Nursing home. On Sunday, August 7th several teen volunteers along with their proud parents joined Chabad of Holmdel to paint and decorate glass honey bowls with their senior friends. 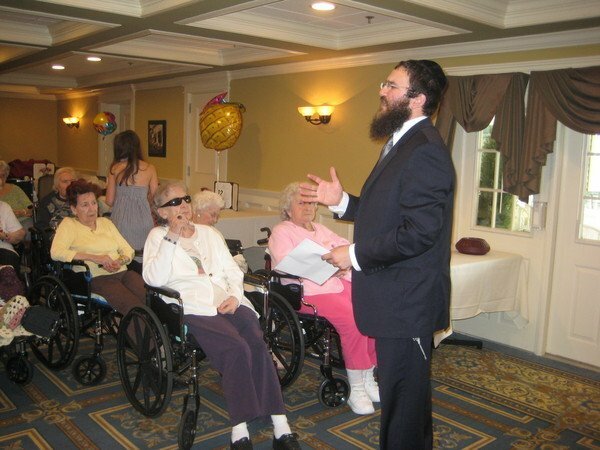 Rabbi Ephraim Carlebach introduced the idea of honey and how it pertains to the upcoming Jewish New Year and blessed the residents with a “Shana Tova” – a year filled with sweetness. With that, the excited crowd of seniors were hard at work, paint and brush in hand with the teen helpers right by their side guiding and encouraging them as they formed their very own masterpieces. After a complete session of arts and crafts and many colorful hands, all the fantastic volunteers were thanked together with the helpful Caretakers at CareOne and of course to our enthusiastic group of seniors who made it all happen! With great anticipation we look forward to our next visit. For more information and details of the program please contact Rochel Carlebach at 732-858-1770 or e-mail at Rochel@chabadholmdel.com.